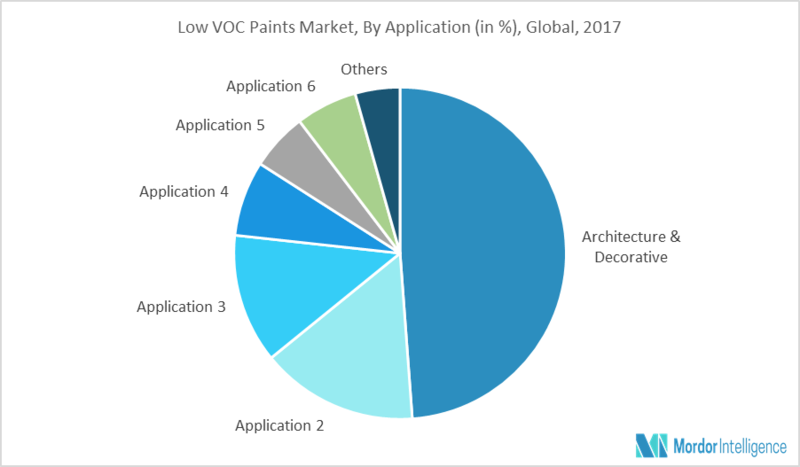 The global low VOC paint market was valued at USD 6,719.72 million in 2017, and is expected to register a CAGR of 6.45% during the forecast period of 2018-2023. The water-borne segment dominated the global low VOC paint market with a share of about 61%, whereas, the powder segment was estimated to register the highest CAGR over the forecast period. Decorative paints help protect the surface from the impacts of weather, make the surface waterproof, protect the surface from the termite attacks, and increase the surface durability, in addition to providing an aesthetic appeal to the building. In addition, they offer protection from corrosion, bacteria, UV radiation, fungus, water seepage, and algae and enhance the life of the structure. The global low VOC paint market is dominated by application in architecture and decorative. The segment is expected to register the highest growth over the forecast period, registering a CAGR of 6.59% during the forecast period. Low VOC paints are majorly employed as interior and exterior house paints, primers, and sealers. The global market for decorative paints and coatings is primarily driven by their growing demand in the construction industry. With the rising urbanization, infrastructure, and purchasing power levels in emerging countries, the construction sector is expected to flourish over the forecast period. Furthermore, the increasing construction of green buildings and shifting focus toward the adoption of environmental-friendly chemicals are anticipated to offer numerous opportunities for the growth of the market. Asia-Pacific has the largest share, accounting for nearly 39% of the global market, in 2017. The Asia-Pacific market is primarily driven by the enactment of stringent environmental regulations regarding VOC emissions, in turn propelling the demand for low VOC or zero VOC paint in the region. China is one of the fastest growing economies in the region, and its construction industry has witnessed a steady growth. Despite volatile growth in the real estate sector, the significant development of rail & road infrastructure by the Chinese government, to cater to the growing industrial and service sectors, has resulted in a significant growth of the Chinese construction industry. Additionally, the rising government investments in the transport infrastructure and water conversation sectors are expected to maintain the growth rates of the construction sector in the country. In addition, the approval of the ‘Green building evaluation standard’ by the government is expected to boost the green building market. Additionally, the Chinese aerospace market is on an upward trend, with the commercial aviation segment demonstrating significant growth. The growing construction and transportation industries in the country are expected to boost the demand for low VOC and no VOC paint market. January 2017: Axalta Coating Systems completed the acquisition of Ellis Paint Company. Major Players: The Sherwin-Williams Co., PPG Industries, AkzoNobel NV, The Valspar Corp., and Nipsea Group (Nippon Paint Co. Ltd), amongst others. Market definition, along with the identification of factors instrumental in changing the market scenario and prospective opportunities. Various market perspectives, with the help of Porter’s five forces analysis. The regions or countries that are expected to witness the fastest growth during the forecast period. The product segment that is expected to dominate the market over the forecast period. The latest developments, market shares, and strategies that are employed by the major market players. 3 months analyst support along with the Market Estimation sheet (in excel). 9.7 Benjamin Moore & Co.
9.9 Bioshield Paint - Eco Design Co.